Shop online for over 2,100 bachmann at discounts up to 67%. 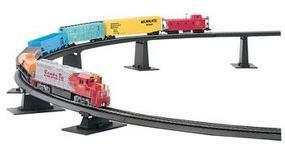 Model Trains is the most popular of the 3 bachmann categories, then Building Supplies, and Accessories. This is a Set of Four 9" Straight E-Z HO Scale Track Sections from Bachmann. This is the HO Scale Pennsylvania RR 1860-80 era Coach Car with Rounded-End Clerestory Roof (#6175) by Bachmann. Suitable for Ages 14 & Older.